Cuckoo clocks are available in various shapes and designs. A popular type of the Cuckoo clock is the Chalet Cuckoo Clock, mostly in the appearance of a original Black Forest farmhouse. Smaller cuckoo clocks often represent a hut, and in larger specimens, a whole farm is often represented. The cuckoo is, however, the central element in all models. He always lives under the roof and looks out of his door at every full or half hour. There is something for every taste. The large premium cuckoo clocks often even have a musicmovement, dance figures, beerdrinker or other moving elements. Lovingly and very detailfully decorated, the Black Forest chalet clocks inspire numerous and surprising details. During the production very much care is taken that the cuckoo clocks are decorated very close to reality. Details such as hand-glued roof shingles, window frames with window shutters, balconies with sometimes elaborate embellishments are a unique testimony of German craftsmanship from the Black Forest. Larger cuckoo clocks in chalet style are often embedded in a small black forest landscape. There are benches, fountains, pets, wild animals and, of course, trees which are meant to indicate the Black Forest. Life in the Black Forest is represented by partly moving figures, often dressed in traditional costume. The built-up scenes show lovingly designed people from the Black Forest partying or working. The moving figures and elements of a cuckoo clock in the chalet style are extremely fascinating. They show that the inventors from the Black Forest have a great love for detail. Dancing figures, wood chopper, beerdrinkers, a mill wheel or ringing bells are just some examples of the manufacturers' thriving wealth of ideas. 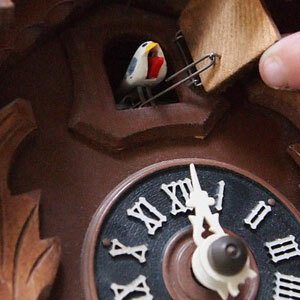 In the production of the original Black Forest cuckoo clocks, traditional craftsmanship meets extraordinary creativity. The result is impressive: the Black Forest Clock, a popular export product for several centuries - Made in Germany.